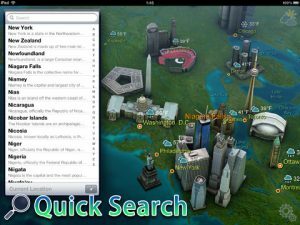 Earth 101 for iPad is an iPad app developed by 3Planesoft. 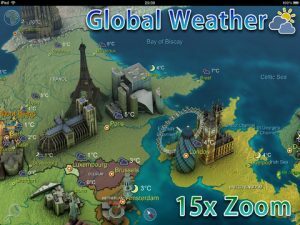 Currently on sale for 33 percent off of the normal retail price, this educational app is designed to showcase “the wonders of the world,” world geographic and political maps, and weather. 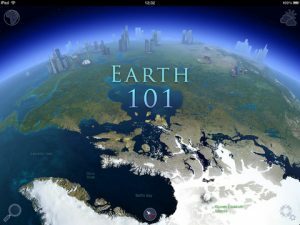 While many just-launched apps can be a big buggy, Earth 101 for iPad was surprisingly stable for a Version 1.0.0 launch. Everything was smooth and stable during our testing. With a 15x zoom, it’s really easy to see the details that you are most curious about. The controls are super simple, and fairly intuitive. I also loved that you can see the Earth as not just a collection of countries, but as a planet with a fascinating array of weather patterns that are constantly changing. No Internet connection is required while using Earth 101 for iPad, unless you want to look up the current weather or any additional information from Wikipedia. And as someone who’s currently writing this review during an Internet outage, this feature is really pleasing. 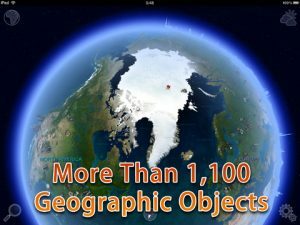 If you’re looking for an education app for yourself or your kids, definitely check out Earth 101 for iPad. It includes tons of info to help students of all ages master geography, and learn a bit about weather as well. With a dash of history thrown in via the “Wonders of the World,” Earth 101 is a worthwhile investment…especially given its current sale price. 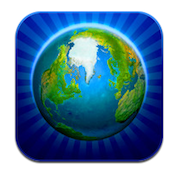 Earth 101 for iPad is compatible with iPad. Requires iOS 4.3 or later.